Get ready for the race of your life! 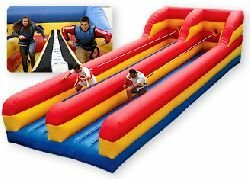 With this 2-lane bungee run inflatable, you and your opponent sprint for the lead, only to be snapped back at the last second by a powerful bungee cord! Who will master the challenge and reach the end of the Bungee Run first? The trick is: run fast enough to get ahead, but not so fast the bungee brings you back to the start in the blink of an eye. Ready? Set? Go!